The ’68 Mustang fastback 2+2 is the type of car that brings back memories of taking laps or going out of town cruising on a hot summer night with great music blaring and a carload of friends enjoying the ride – and the sleek orange fastback shown below is a perfect example of the cars that great memories revolve around. 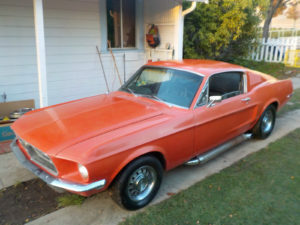 Looking to Buy a 1968 Ford Mustang Fastback? This vibrant orange Mustang fastback is for sale on eBay as of the publication of this article, and it’s sure to be a head-turner if you’re looking to buy a classic Mustang. The seller shares a great story about this iconic ’68 Mustang. The car was given to a chef who was always late for work in the mid-1990s, and it inspired the chef to start getting to work on time. Then, when buying his own restaurant, he sold the car to the eBay seller with a promise of a lifetime supply of huevos rancheros. The seller mentions that he has over 100 pictures of the car available, so serious buyers are encouraged to reach out to him via the eBay listing, which you can access by clicking on the photo or link under it. This fastback has new brakes, solid trunk, solid rear quarters, and has been in dry storage for about ten years, though the fuel line needs an upgrade asap. This car needs some work, but it is in driveable condition as it sits. According to the official Ford brochure for the 1968 Mustang, three body styles were available, the convertible, the fastback 2+2 (like the one featured in the photo) and the hardtop. Six different engine options were offered, five stanrds options and one special order – including the 115 hp 200 cubic inch six, the 195 hp 289 cubic inch Challenger V8, the 280 hp 302 cubic inch Challenger Special V8, the 280 hp 390 cubic inch Thunderbird V8, the 325 hp 390 cubic inch Thunderbird Special V8, and the high-performance 302 V8 that was only available by special order. Classic Cars Online US is proud to partner with eBay to bring you this information on the 1968 Ford Mustang Fastback by showing you the ’68 Ford Mustang Fastback for sale in the photo.